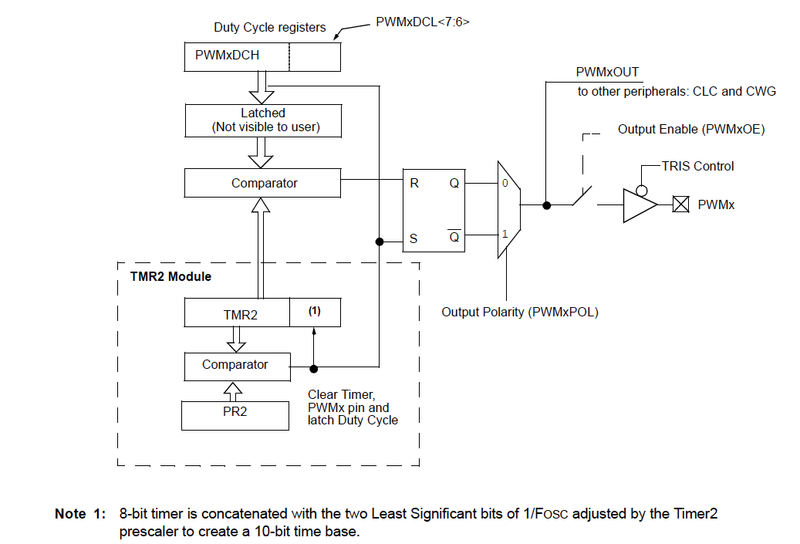 10-Bit Pulse Width Modulation (PWM) can be a stand-alone peripheral on some newer PIC® MCU devices, incorporated into the Capture Compare PWM (CCP) peripheral, or incorporated into the Enhanced Capture Compare PWM (ECCP) peripheral. In all cases they operate in a very similar way. The 10-bit PWM is controlled by Timer2 within the PIC® MCU. Timer2 is incremented, through a 1:1 prescaler, from the instruction clock which is the output of the system oscillator run through a 1:4 postscaler (Fosc/4) . Timer2 is actually an 8-bit timer so to get 10-bits of resolution Timer2 is combined with the two least significant bits of the Fosc/4 postscaler. To slow down Timer2 the prescaler can have a setting of 1:4, 1:16 and on some devices 1:64. When the prescaler is used beyond 1:1, then the lower two bits of the 10 bit Timer2 come from the two least significant bits of the prescaler. On some devices with multiple PWM peripherals, there may be additional timers such as Timer 4 and Timer 6 which are essentially additional Timer 2 Peripherals which, allows each PWM module to be set to a unique timebase. The high time of the PWM signal is controlled by a 10-bit value that is stored in two 8-bit registers; PWMxDCH and PWMxDCL on the stand-alone PWM or CCPRxL and CCPxCON on the CCP and ECCP peripherals. The PWMxDCH or CCPRxL register contains the upper 8 bits and the PWMxDCL or CCPxCON register contains the lower two bits. When the 10-bit value in these two registers matches the value in the 10-bit Timer2 concatenation, the PWM output will switch from a high setting to a low setting. This creates the pulse-width of the signal and determines the duty cycle. The Timer2 continues to run after the output switches state, until its upper 8 bit value matches a second 8 bit value stored in the Period Register (PR2). When these match, the PWM output changes state from low to high and Timer2 is reset to zero. The value stored in PR2 determines the period of the PWM signal and by default the frequency of the signal. 1) Calculate the PWMxDCH:PWMxDCL or CCPRxL:CCPxCON value for the desired signal pulsewidth. 2) Calculate the PR2 value for the desired signal period. Note: This example is setup for a stand-alone PWM but can equally apply to a CCP or ECCP peripheral setup in PWM mode. Typically a desired frequency is already known so the period formula can be reworked to solve for the PR2 value that meets the frequency requirement. If the number ever calculates to a value larger than 255, then you would have to increase the prescaler to a larger ratio or lower the oscillator speed. 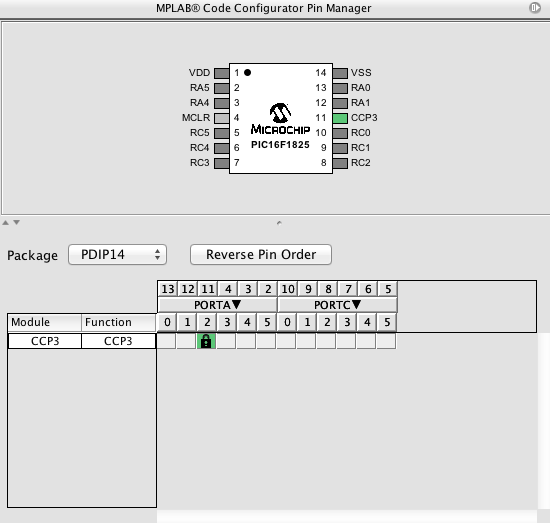 The MPLAB Code Configurator (MCC) makes setting up a 10-bit PWM peripheral easy. The steps include setting up the I/O, Timer 2 and PWM module to make it run. The MCC will automatically generate the code to load the proper registers and initialize the proper values to produce the desired PWM signal. The best way to show how this is done is through a simple example. A PIC16F1825 Capture/Comparae/PWM peripheral will be configured to create a PWM signal at: 500Hz, 50% duty cycle using a 4Mhz system clock and 1:16 prescaler. The first step after launching the MCC within MPLAB X® is to select the peripherals we will use and setup the PWM. 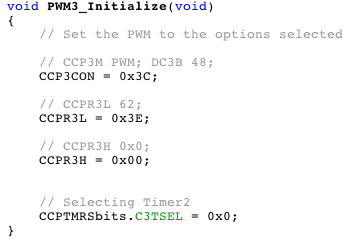 The three resources required are the System, TMR2::Timer and the CCP3:PWM modules with the MCC list of options. The System is where the oscillator speed is selected and any changes to the configuration settings you may need. The 4 MHz internal oscillator is selected as shown in the picture below. Timer 2 uses the oscillator selected in the System section to adjust the Timer 2 period. The time of 2.0 milliseconds is entered for the period to yield a 500 Hz frequency. The prescaler is selected as 1:16 from the drop-down menu. The Start Timer After Initialization box is also checked. This will start the timer running and also the PWM signal after the PIC16F1825 finishes initializing all the peripherals. By selecting the CCP3:PWM the MCC automatically selects the I/O pin RA2 in the I/O selection window. The RA2 pin actually shows up with the label CCP3 in green to show that the CCP3 peripheral now controls the I/O pin. The CCP3:PWM setup screen is where the Duty Cycle is selected and 50 is entered for 50%. PWM period and frequency are displayed in this window as well based on the Timer 2 selection window. When all the setup screens are complete the MCC Generate Code button is clicked and the MCC produces the software files for the project. 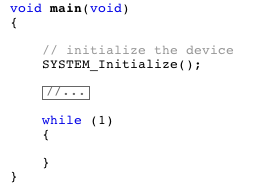 The MCC will produce a MAIN.C file that contains a System Initialize function as it's only component. The System_Initialize function is placed in a file named MCC.C. The OSCILLATOR_Initialize function takes the Oscillator Settings selected and sets up the proper registers for the 4 MHz internal oscillator. 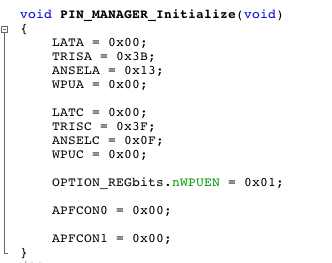 The PIN_MANAGER_Initialize function sets the registers for the I/O pins. The TMR2_Initialize function sets the registers for the Timer 2 settings selected including the prescaler and PR2 value. The PWM3_Initialize function selects the settings for the 50% duty cycle value. 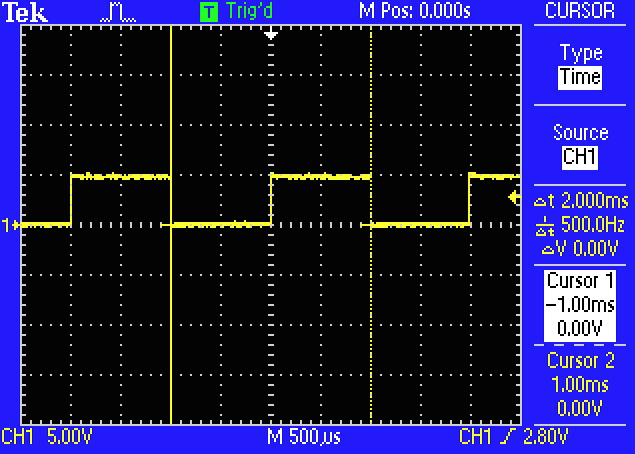 Notice the CCP3RL register is loaded with the proper value to create the proper high time of the 50% duty cycle. The code is then compiled within MPLABX IDE environment and programmed into the PIC16F1825. The device will start operating as soon as it's powered up. 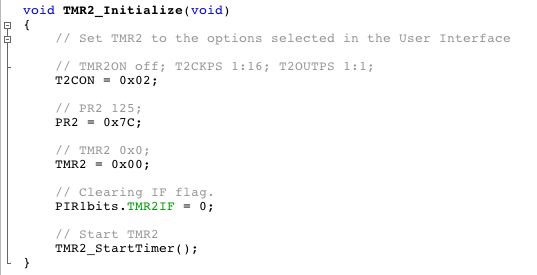 Timer 2 will start running immediately after the initialization phase of the code. The results are shown on the oscilloscope screen capture below. The screen capture shows, in the measurement section, a period of 2 milliseconds and frequency of 500 Hz as we expected. Each pulse is an equal 1 milliseconds off the center of the signal for a perfect 50% duty cycle.